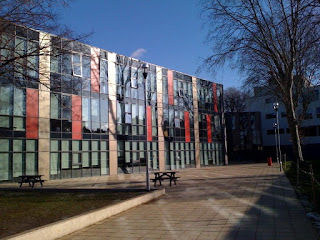 Here are some pictures from the new Stockwell Park High School building taken last week. The school is the first in the ‘Building Schools for the Future’ programme to receive an ‘Excellent’ rating for architecture and build environment from the Committee for Architecture and Build Environment (CABE). Phase 1 of the building is now open and the remainder of the building will be in use by Summer 2010. The new features include a new amphitheatre for drama, new gardens with allotments, a revamped dining room, a new sports hall and ICT suites. GCSE results at the school were up by a staggering 21% in the last set of results, with the school the most improved in Lambeth. Headteacher Judette Tapper said: "This has been a wonderful journey and the new building is a central part of our school's vision. It provides us with an opportunity for continuing to develop outstanding learning for the children at Stockwell Park High School." 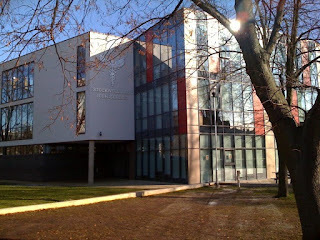 The school is very impressive and boasts some great facilities. The local community will benefit greatly. It's a shame however that the previous swimming pool wasn't part of the plan. Even local MP Kate Hoey campaigned for it to be saved, but alas the bulldozers moved in. I've got some sympathy with your view - a swimming pool would have been good, but there were a number of difficulties with the local community and the school - as far as i'm aware, local residents wanted the pool to be open to them at some points, but the school objected to the cost of that. Nevertheless there is an all weather pitch being used, so a sports facility nonetheless.